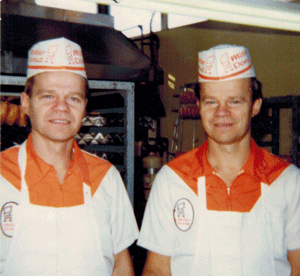 Home Cut Donuts has been a family business from the beginning. Bill, Bob and Dave Ruhaak, three young brothers, invested everything that they had, and opened the doors at the end of April 1966. Their work ethic and quality products were an instant hit in Joliet. Bill’s son Jim took over in 2000, and has done his best to continue his family’s tradition of excellence. Very little has changed at Home Cut Donuts since day one, and we plan on continuing to deliver the same experience into the future. Both of our locations are open 7 days a week, continuously producing our delicious donuts and pastries for our customers to enjoy fresh everyday! Email us at homecutdonuts@gmail.com or call our Customer Service and Sales line at (815) 727-3511. Visit our Facebook and review us on Yelp!